It's a big year for penguins around here. The Calgary Zoo opened their penguin exhibit and I have had lots of requests for penguin projects. Here are Grade 1's clay penguins. Isn't this one adorable with the little penguin sliding away on it's belly! Put your cloth placemat on your workspace. The cloth stops the clay from sticking. Roll out a slab with your rolling pin. Cut a piece off your clay block and then roll to about 3/4's of an inch thick. With the nail cut a nice oval shape for your base. For Grade 1, I pre roll the slabs, I can often get 2 ovals from a slice off the block. Dip your finger into the water and smooth any rough edges around your cut edge. Now we will start making the penguin body. Take a lump of clay and roll into a fat sausage shape. I want a flat bottom to attach to the base so I lightly pound it on the table to make it flat. With the wooden skewer make little scratches on the bottom of your penguin and on the base where you want it to go. Dip your finger in the water and rub a little on the scratches. At school the kids all know my "scratch, scratch, water, water" chant. Attach the body to the base. I tell the kids that the scratches have to kiss, that usually gets a lot of giggles but they remember it. Take some more clay and roll a head between your hands. You want a good place for your head to sit so take your finger and make a depression at the top of the body where your head will sit. Now in my sample I scratched in a line to separate the belly but I found it easier to skip this step with Grade 1. "Scratch, scratch, water, water" your head. Take some more clay and roll it out. With the nail cut 2 wing shapes. It is like a leaf or eye shape. Cut 2 triangles for feet and attach these in front of the body or up onto the body like the penguin is sitting in the snow. With the skewer you can mark in the toes. Make a little triangle and attach for the beak. Using the skewer mark in the eyes. Now you can add some snowballs to the base. Finally I want to make sure my penguin dries out fully so I take a pencil and poke a hole down thru the back. Place the penguins aside to dry. Drape with a garbage bag or plastic tablecloth for 1-2 days to let it equalize. When leather hard then remove the drape and let it dry out completely. I let them sit for 2 weeks to make sure. We are lucky in Calgary as the air is very dry. I put a wax coat on the bottom of the penguins to stop them from sticking to the kiln shelf. Glazing is always an adventure especially with young kids. Despite our best efforts we still have a few orange bases but that is part of the charm. That's it. Takes a while but it's a great project. I made these papier mache hearts with Grade 3 last year and did not get a chance to post them. They turned out surprisingly well. Take your cereal box and cut out a heart shape. Mix some white glue with water in a recycled container. I mix it at a 1 to 1 ratio. Tear some kleenex into strips or pieces. Working on a piece of wax paper, dip kleenex into glue mixture. The kleenex will clump. 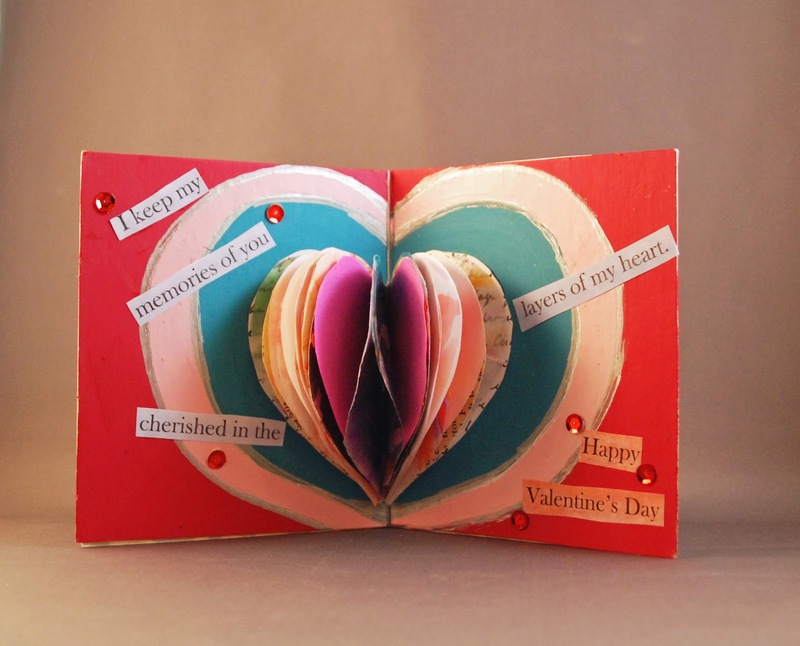 Place these clumps onto your cardboard heart. Add some dry pieces once and awhile to soak up the excess glue mixture. You are making the heart appear 3D. Leave to dry for a day or two. This is the 'cheap' method with supplies you have on hand. Last year I used celluclay with the kids as I was testing the product. 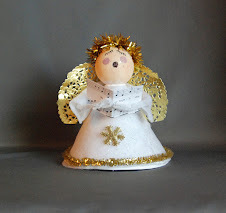 You can buy this at your local craft store but the 'cheap' method is just as good. The celluclay comes dry with the paste already mixed in. You place in your recycled container, add water, and mix. 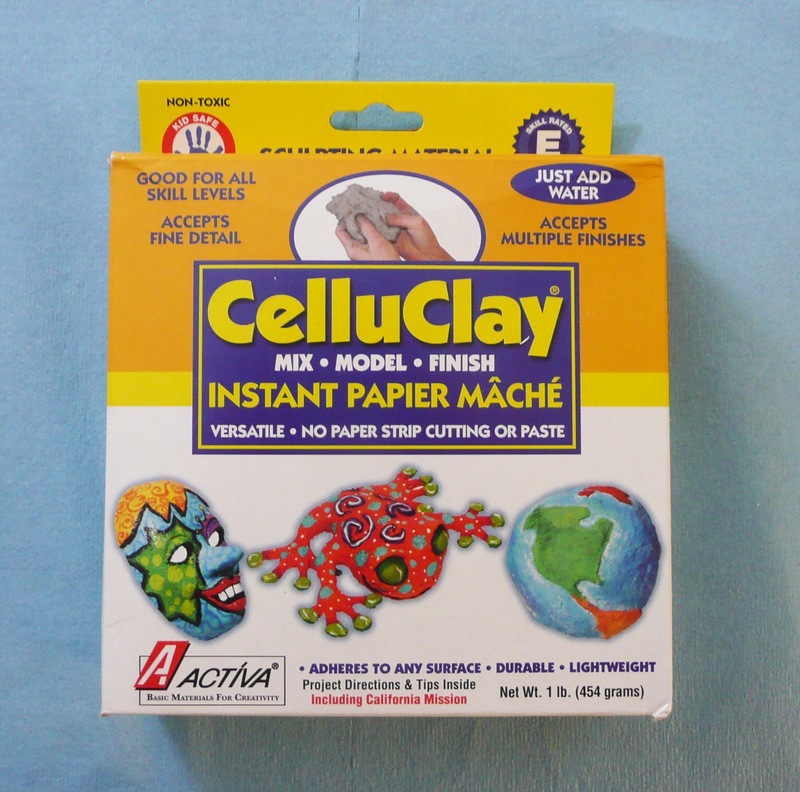 I find the celluclay very sticky! 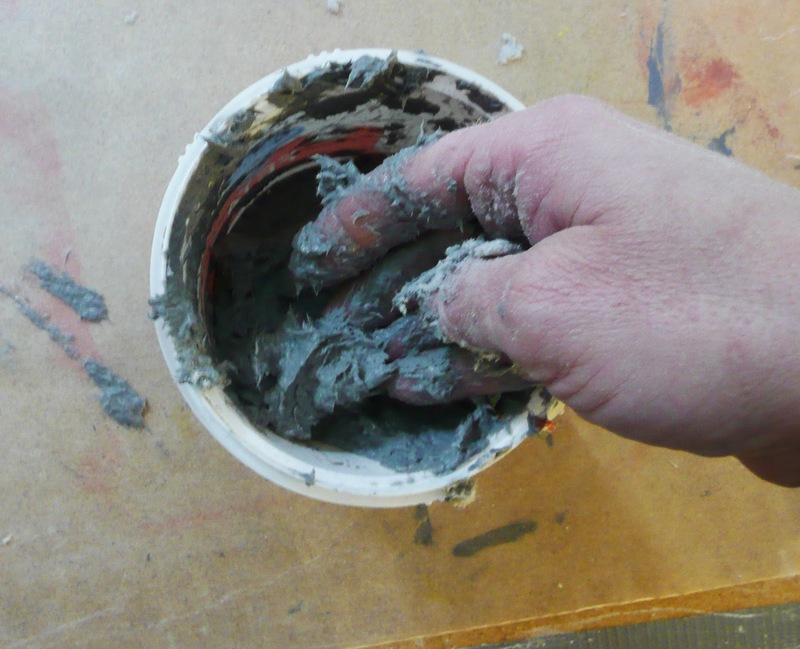 You could also use paper clay or drywall medium to achieve the same result. When the heart has dried cut a set of wings out of the remaining cereal or cracker box. They kinda of look like a big moustache. You will have to measure with your prepared heart to get the sizing right. In the classroom I set up a painting station with a few art boards. Use liquid tempera to paint the prepared heart. I gave each student a piece of coloured card stock. They had to trace around their wings and then cut the card stock slightly larger. This was glued to the coloured side of the cardboard. They also received strips of white tissue paper to cut into squares. They then smooshed these into loose balls. They applied tacky glue to the cardboard wing shape and started filling in the space with the tissue paper. I asked them to leave some space in the centre free of tissue paper. When the hearts were dry we glued these into place. 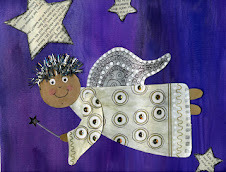 When the glue had dried I took my awl and punched a hole at the top thru the heart and wings. I threaded a large needle with yarn. This made threading the heart much easier. I passed the needle thru the hole I made and then tied off a loop for hanging. We now added text. The kids typed in sayings onto the computer and then choose a nice font and printed them off. You could also just use your nicest handwriting. Some common sayings were "You make my heart soar!" and "You give my heart wings." Glue these into place on the heart and you have a great Valentine gift. I know lots of Moms last year who were quite taken with their special valentine. I was kicking around some unique book ideas this fall and here are a few I came up with. 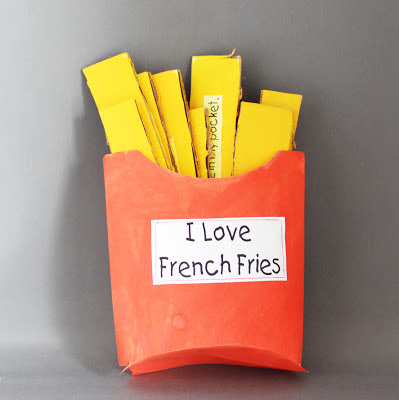 Now I know it's not the healthiest example but what kid doesn't like french fries once and a while! When you pull the fries out you have the pages of your book connected by a chain. This is a sandwich book, which could easily be a hamburger, taco, or even a wrap (that could be a scroll book). 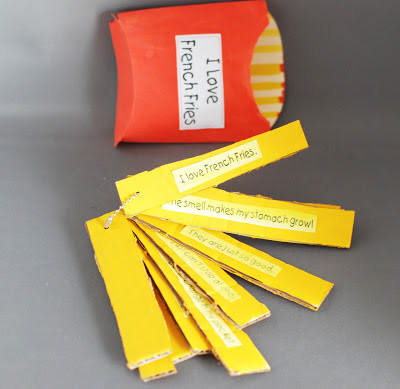 Let's start with the french fry book. 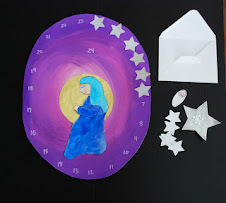 Using the template trace the container shape onto a piece of manila tag or cardstock. Using disk tempera paint some yellow stripes on the inside of the container shape. Paint the other side red. Take your corrugated cardboard and cut into long rectangles. Make them all slightly different lengths. Paint both sides with the yellow liquid tempera or acrylic. Type out your story/poem on the computer or hand letter. Paint with yellow disk tempera. Cut your sentences out and glue onto the fries. Poke a hole in the bottom of each fry with an awl. Thread a chain thru the fries in the order of the story or poem. I collect these ball and chains. It seems every new pair of pants, shirt, etc seems to have one of these to attach the brand tag. It is very easy to recycle these. Attach a label to the front of your container. This is your title. Crease the fold lines with a bone folder or ruler. Put some glue on the side seams. Fold the container together. Your container should look like this. Place your fries chain side first into the container. 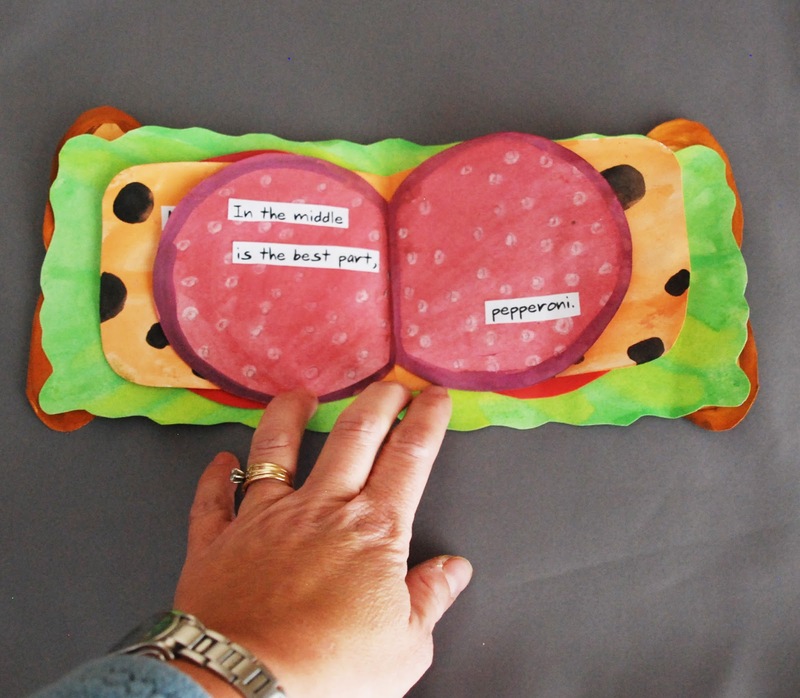 The sandwich book is made up of pages that represent the layers. You need a piece of paper for each layer. Cut a double page for the layer. You can see my lettuce page here. It is one large page folded. Your double page doesn't necessarily have to have the same shape on both sides. I could have cut a lettuce slice on one side and then a cheese slice on the other. Just maintain that fold so you can staple it all together. 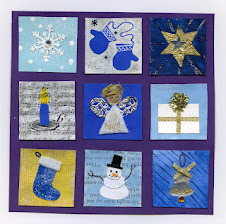 Put all the layers together and then staple, glue, or even sew along the middle fold. 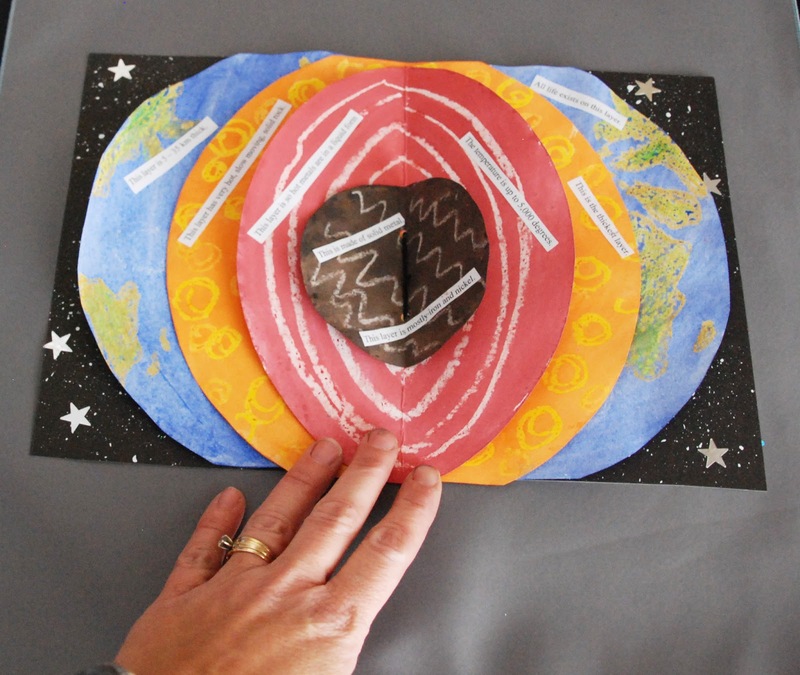 Here is another of these layered books I have made with Grade 3 that shows the layers of the earth. 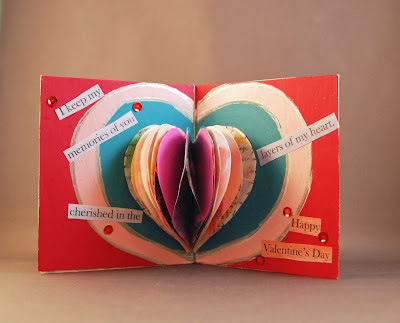 and last year I showed you this heart book that is a similar layered book. Hope you enjoy the book projects and I'll see you next time.